A tweak here and a tweak there can knock pounds off your feed bill. Here’s how. An essential range for all horses and ponies, the Nettex Joint Care range of supplements is designed to help maintain healthy joints and muscles. A healthy joint is much better equipped to cope with the effects of concussion and everyday wear and tear. The Nettex Joint Care range is made up of a number of different supplements, each will offer fast, long lasting relief and ensure your horse is comfortable and allow him to move with greater mobility and flexibility. Substi-Bute is a unique and innovative natural supplement. Available as a maintenance powder and a syringe. Substi-Bute is a formulation which contains a unique combination of ingredients including Curcumin and vitamins C & E, which are thought to be vital anti-oxidants to help support joints and muscles. Substi-Bute is ideal for all horses, from leisure horses and ponies, hunters, competition horses, polo ponies, showing, showjumping, dressage and older horses too. It can be fed daily and the syringe given before and after strenuous exercise. Substi-Bute Impact Syringe may help to ease minor bumps and bruises, minimising time off and interference with a horse’s competition schedule. Substi-Bute Maintenance Powder is also ideal for older horses to help maintain comfort and quality of life. Joint & Muscle Maintenance can be fed to horses and ponies of all ages and disciplines. Helping to maintain healthy joints and muscles is the key to helping reduce the consequences of everyday wear and tear. The next generation of joint supplements, its V.I.P® formula works synergistically to provide highly bioavailable joint and muscle support to help maximise mobility. Glucosamine and Chondroitin have long been known to be beneficial as building blocks of joints, however the inclusion of five isolates in Nettex V.I.P® So Sound means that less of the parent compound is required to gain the same effect. 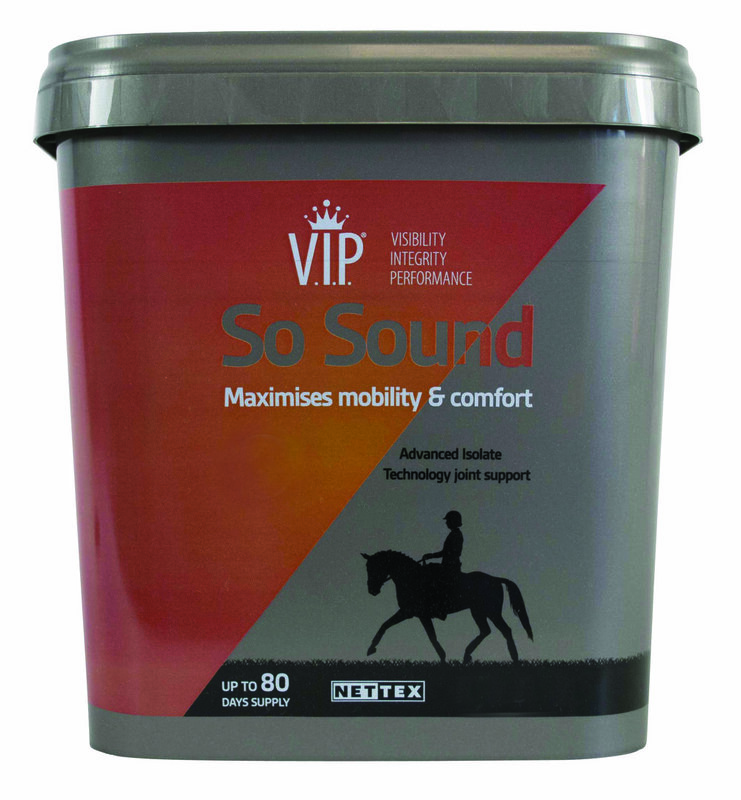 The synergy of joint support, and herbal extracts for comfort will help your horse stay ‘So Sound’. All Nettex nutritional supplements are tested for naturally occurring prohibitive substances. The Nettex Joint Care Range is the choice of top riders, such as Olympic gold medallist, Carl Hester.